A large Oil and Gas customer needed to perform maintenance on 3 tanks in one of their West Texas terminals. The majority of the maintenance was focused on removing and replacing the shell-side mixers. The problem was that those same tanks were critical to their day to day operations, meaning that the turnaround time from landing the roof to refloating it would need to be as short as possible. Historically, the terminal had taken the tank out of service degassed and cleaned them before performing the maintenance. This process was not ideal since the tanks would come up on API 653 inspection in about a year or so, and performing the entire work twice was not economically viable. The site was also restricted by a very strict environmental permit, along with having tanks with an average H2S concentration of about 2,500 ppm. A solution for a quick and safe manner to perform the maintenance was needed. Envent worked with the site’s engineering team in planning and preparing a method to safely control vapors from the tanks during the stripping of the tank’s product, the change out of the existing shell-side mixers, and during the recommissioning of the tanks. A process was engineered in order to maximize the vapor draw from the tank’s existing roof connections during the maintenance phase, this allowed the customer to only lower the liquid volume in the tank enough to perform the maintenance instead of fully emptying the tank. This enabled the customer to liquid balanced the other two tanks and avoid any temporary storage. 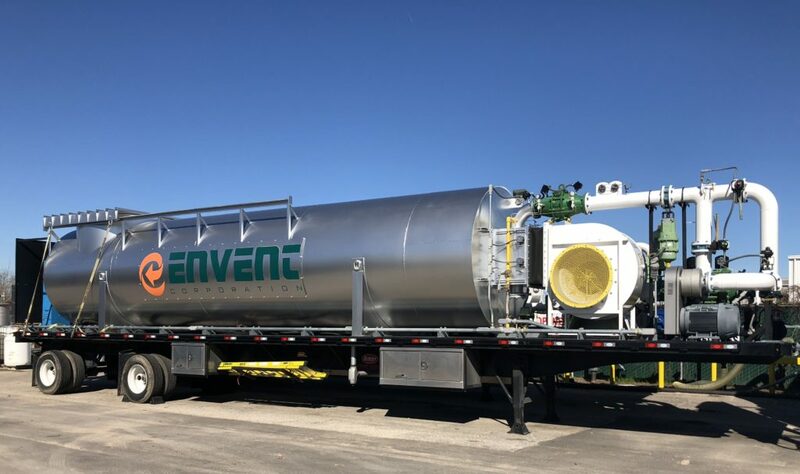 Envent utilized a thermal oxidizer capable of an outstanding 10 million BTU per hour load, along with a Stainless Steel Recirculating Scrubber. The customer was able to perform the needed maintenance on three tanks all in record time. Where in the past similar maintenance had taken a (1) tank one and a half week s to complete; all three tanks were completed in around 10 days total. The environmental impact was much less than ever expected; the thermal oxidizer enabled a 99.99% destruction efficiency of hydrocarbon vapors. Envent’s mobile scrubber also removed all H2S in the vapor stream prior to combustion; this not only kept the maintenance crew safe from any exposure but also kept the Customer within their environmental permit.